WAUKEGAN, IL, November 7, 2018 – AMETEK Powervar, a leading supplier of uninterruptible power supplies (UPS) and power conditioning solutions, has introduced its 3400 Series UPS. The 3400 Series features advanced IGBT technology, superior performance characteristics, and a transformer-less design. The 3400 Series’ space-savings footprint measures only 27.5” W x 32” D x 71” H, requiring minimal floor space. It is available in 80kVA/80kW, 100kVA/100kW and 125kVA/125kW to support data centers, medical imaging, clinical diagnostic instruments, municipalities, and other power-critical applications. Utilizing three-level IGBT technology, the 3400 Series achieves a 96.3% efficiency rating (AC to AC), which leads to overall operational savings. Another key performance characteristic of the 3400 Series is its ability to withstand and hold a 300% inrush (current) and stay online for 240 milliseconds. By doing so, it is possible to downsize the kVA of the UPS unit in specific applications. “The 3400 Series underwent the same rigorous testing as our 3200 Series, and in doing so, will have the same high reliability when installed in the field,” he adds. "The 3400 Series will be our most powerful and versatile UPS solution to date," explains Chris Walsh, Director of Global Sales and Marketing at AMETEK Powervar. 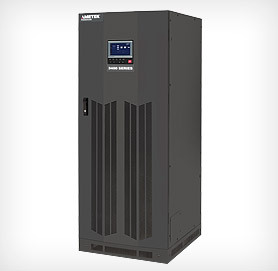 The 3400 Series UPS is available throughout North, Central and South America and offered with a full two-year warranty that includes the UPS, battery cabinets and MBS systems. For more information, contact AMETEK Powervar at 1-847-596-7000; e-mail: cservice.powervar@ametek.com or visit: www.powervar.com. AMETEK Powervar (www.powervar.com) is a global provider of power management systems, headquartered in Waukegan, Illinois, with international sales and service offices in United Kingdom, Canada, Germany, Italy and Mexico. The company's primary products include transformer-based power conditioners and uninterruptible power supplies (UPS), which support a plethora of diverse vertical markets. Powervar is a unit of AMETEK, Inc., a leading global manufacturer of electronic instruments and electromechanical devices. For more information, visit www.ametek.com.